Malvermi L. Café, 16 Endell St WC2 COVent Gdn 0255. With the introduction of all figure numbering this entry changes to show the telephone number as 01-240 0255 in the 1967 edition of the L-R London directory. and continue to do so until 1984 when the Post Office became British telecommunications plc and I do not have access to their historic records. 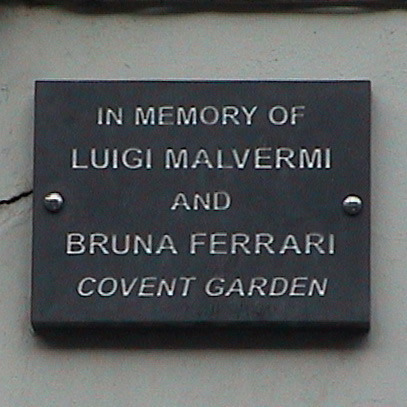 So it would seem that Luigi Malvermi was running a café at 16 Endell Street from at least 1954 (he may have been there earlier but only had a telephone line installed and listed in the directory in 1954) and the business was transferred to Bruna Ferrari around 1967 or 1968. I have no idea when she actually ceased trading. 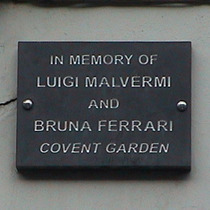 Since they share a plaque we would guess that, for at least a part of its life, the cafe was run jointly by Malvermi and Ferrari. Perhaps they were related, father and daughter, husband and wife?